Now that summer’s in full swing, do you feel the same way when you look at your blank computer screen? If you want to be anywhere but in front of your empty screen, here’s help in the form of writing inspiration integrated into 99 Free Blog Titles and how to craft them into a post that’s uniquely yours. The hot weather (at least in the northeastern US) makes the summer a special time. The days are longer. Everything seems brighter. What I did on my summer vacation. This classic may cause severe writer’s block. If so, try the opposite? 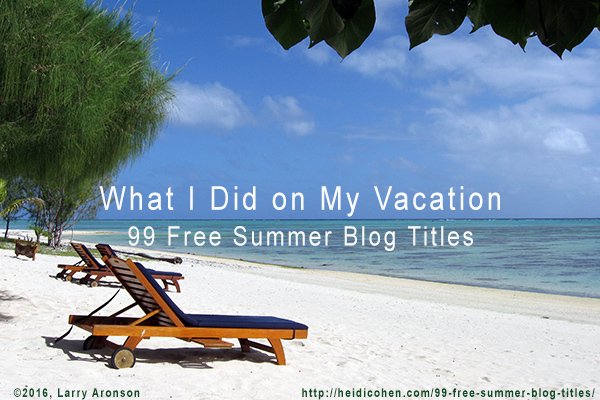 What I didn’t do on my summer vacation. Did you just unplug? Shape up for the summer. What did you do to get in shape for the summer? Long summer days. What do you do with to take advantage of longer summer days? Summer reading. Who can ignore the need to read over the summer? What’s on your list of beach reads? This topic can be adapted to fit any blog topic. Did you have special summer homework? What’s on your kindle? This is an updated version of the summer reading list. Summer school. Did you ever have to go to school to make up for a class that you failed? How did it feel and what did you learn? Summer chores. What did you have to do every summer? What do you do as an adult? Summer photos. Use photographs (or video) to tell your summer story. Lazy summer afternoons. Where did your thoughts roam? Change of scenery. What did you learn by just getting out of your regular space? It can be something small or something big. Heat warning. How did you cope with the heat? Love it or hate it, what did it mean? Summer slow down. Often the summer’s a good time to take things slowly. Fireworks. Does something your blog covers scream out for special treatment? County fairs. Did you go to county fairs? Did you bring baked goods? Did you ever compete? If so, what was your experience? Let’s ride the ferris wheel. Whether it’s Navy Pier or your local amusement park, what did you experience when you went on rides. Life’s a roller coaster. While everyone may not be able to ride the Coney Island Cyclone, it’s a great metaphor for life’s ups and downs. Take me out to the ballgame. Did you go to a baseball game with your dad? Little league lessons. Did you play baseball for a little league? If so, what did you learn about everyone playing together? Go ride a bike. Did you remember taking long bike rides in the summer time? If so, where did you go? Tree house fun. Did you have a tree house or other special summer hideout, away from the grown-ups? Swinging in the hammock. Did you see shapes in the clouds? Camping in the backyard. Did you just pitch a tent to be outside or to make room for guests? Children seem to grow faster in the summer. What’s new & different this summer from a kid’s perspective? Letters home from camp. Do kids still send notes home? When I went to camp, we had to write home once a week. It’s a great metaphor for creating posts with updates. Scary stories around the campfire. Another camp scenario. Were you scared when you heard them? Did you help contribute to the stories? Why or why not? Summer mad libs. The perfect camp gift where everyone fills in the blanks. What about making some mad libs of your own tailored to your readers? Arts and crafts lessons for real life. Camp brings to mind arts and crafts. My mother still has a tiled trivet from my camp days. Can you pitch a tent in under 15 minutes? Did you spend time outdoors with your family or friends? What did it teach you about people? Care packages from home. What camper didn’t want to receive stuff from home, particularly if it contained candy?This can be useful to discuss other types of special packages. Whether you’re at home or away, water sports are often part of everyone’s summer. Pool time. How did you spend your time with the local kids? Did the kids in your neighborhood act the same way they did at school? Go jump in the lake. This works as a metaphor for more than the local swimming hole. Gone fishing. Did you enjoy fishing? Did it teach you patience? Was it an activity that you did with your brother or father? Row, row, row your boat. Did you learn to row a boat and how did it feel to be on the water? Balance your canoe. Did you go canoeing? Did you tip over? Motoring across the sound. 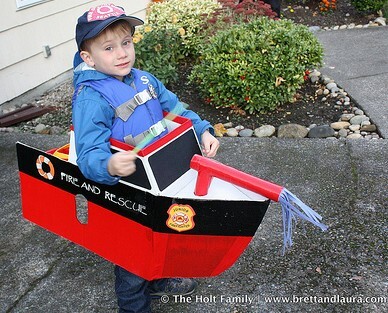 Did your family have a motorboat? Did you go water skiing? Sailing across the bay. Did you learn how to sail at summer camp? Can you navigate local waters? Navigating distant shores. Did your family take a boat trip? Did you always dream of taking a boat somewhere? Most people have taken at least one family vacation, whether it’s to visit other family members or to spend “us” time. No matter what, it’s always highly charged. As a kid, my family rented houses on lakes. How to survive your family for 10 days. While families are great, sometimes there’s too much togetherness. Did you have frequent guests? The water is always too cold and other lessons from mom. Of course, every mother steers her children to things that she wants to do. My mother rarely got more than her feet wet. Postcards from the road. I’m not sure many people still send these but postcards are a great way to write about a trip or other activity that happens over time. On the road with grandma. Did you spend time with a favorite grandparent? If so, did you learn something special from one of your relatives? History comes to life. Did you visit special landmarks or historical places? My mother was great at finding historical places across the northeast. Visiting grandma and grandpa. What was it like having a long visit with your grandparents? Did they treat you special? Let’s go abroad. Did your family take a major vacation together? If so, what did you do? Was everyone involved in the planning? Taking a trip down memory lane. Did your family go back to some place where one of your parents grew up? Let’s experience nature. Did you go on hikes or other nature oriented adventures? City sights. Did you go to any big cities such as New York, Washington, Chicago, Boston, Los Angeles, San Francisco or Miami? Of course, bear in mind that “big city” is a relative term. Some summer vacations are about the journey, not the destination. Daddy, are we there yet? Are we there yet? What was it like in your family’s car? Did your father drive endlessly without a stop? What I learned counting signs across America. Use road signs as a way to break up your story. 567 Miles to go. Fill in your own number of miles to make it relevant to your specific topic. 10 Games to keep kids amused in the car. Every parent can use more ways keep the family calm during a family trip. Don’t forget the blankie. What happens when you go away and forget something that one of your kids is attached to? Family sing alongs. Songs to pass the time. How to read a map. What did you learn from following your family trip on a map? Obviously this may not work for the GPS generation. Mapping our vacation. In addition to planning your vacation, this can be used for other bigger issues. Where are we going? This can be a metaphor for navigating through some difficult period. We’re lost. How did your family deal with crises? What happened to Sally? Did you or one of your siblings ever wander off? Should we take the scenic route? Do you balance aesthetics and practicality? Detours. What did you learn by being forced to take an alternate route? Are you sure that we have a spare tire? What happened when you got a flat tire? How do you plan for the unexpected? Touring the national parks. What was your family experience at these parks? Summer means sea, sand and shore. what’s your favorite beach? What’s in your beach bag? This is a great opening for an inventory post. 10 Exercises to do on the beach. What do you do to exercise on the beach? 5 Sure-fire beach snacks that won’t melt. Did your mother have a set of snacks that survived most of the day? Suntan lotion and other gripes. Did your mother have special rules about suntan lotion? Don’t forget your beach gear. What did you bring to the beach that’s unusual? Personally, I knit on the beach. What’s under your umbrella? This title begs for an intriguing story. Beach towel gossip. Did you and your friends share special secrets on the beach? Tar beach adventures. This is the city equivalent of a sandy waterside, so you may want to give your post an urban edge. Why I never wear a bathing suit. Buying a bathing suit is one of the most difficult purchases women (and men) ever make. How does it make you feel? Building sand castles. Did you spend time building sand fortresses? Tunneling to China and other daydreams. Were you the expert at digging the largest hole on the beach? Did you imagine that you could reach distant lands? Did you grow up to fulfill those dreams? Surf’s up. Did you learn to surf? This is great for Southern California and Montauk, NY. Jumping the waves. Did you try jumping over waves? What was it like to get swept away by a wave? High tide. Did you ever miscalculate how fast the tide was coming in and your stuff got soaking wet? Looking for shells. Did you search for the ocean’s treasure on the beach? Did you look for special shells or just white ones? Beach volleyball. Did you play well with others? Go fly a kite. Kites are a great beach activity. Summer storm watch. Did you ever get caught in a storm at the beach? Were you scared? Summer is full of plantings. Plant your garden. What’s in your garden? What did it teach you about starting projects correctly? Putting up food for the winter. What did you learn about planning ahead? Let’s milk a cow. Did you ever get to see how we get milk? Let’s find dinner. Did you go on hikes to scavenger for food? Groups do this in suburban New York City. Haying. Did you ever help harvest hay or another crop? Did you have fun on hayrides? What did you learn? Summer jobs can be fun such as being a camp counselor or they can be trying such as working in a fast food restaurant. What I learned about management from my fast food summer job? Face it no one likes their summer jobs but you can learn a lot about how to treat employees. Babysitting lessons. Did you have to take care of your siblings or neighbors’ children? What did you learn? Lawn mowing adventures. Did you make summer cash by taking care of neighbors’ lawns? What I learned being a camp counselor. Did you ever think about the larger issues? For example the difference between the kids who had money and those who didn’t. What do you eat in the summer that you can’t get other times of the year? Tasting hot dogs across New England. Is there some special food that you try wherever you go? Friends took us to a great hot dog place up in Maine. Of course there’s Nathan’s hot dog eating contest. Dad’s barbeque lessons. What did you learn about food, cooking or being a man from your dad? How do you slice your watermelon? Watermelon is a quintessential summer fruit. Eat a peach! Great start for a series of recipes. Stopping at summer farm stands. Use the summer farm stand as a way to talk about what’s in season in your corner of the world. Picking berries. What was it like to pick blueberries or strawberries? Did you eat more than you brought home? Can we stop for ice cream? Who doesn’t love ice cream in the summer time? (Of course, some of us can eat it all year long!) I was inspired to write about ice cream sundaes. Lobster roll and other summer delicacies. Did you have a special family food ritual that was associated with your summerhouse or different routine? Watch out for lobster pots. Depending on where you grew up, there may be special issues. My family spent a month in Maine and bought lobsters right off the boats. Love it or hate it, everyone has memories and associations with summer – including your customers, prospects and employees. Regardless of the title you pick, you’re sure to get your creative juices flowing. Do you have any other summer-related titles that you’d add to this list? If so, please include them in the comment section below. Note: This post was first published on July 10, 2011. It has been updated for today’s readers. Photo Credit: Beach and Blue chairs ©2016, Larry Aronson. Tags Blog, Free, free blog title, free blog topic, Summer. Bookmark the permalink.